I got like 20 books from my mom for Christmas. I love reading. It is possibly my favorite hobby (does it qualify as a hobby, I'm not sure). But I've been catching up on reading them. Now, you may be asking yourself how I have time to read (or you may not be asking that at all). I've been taking books with me to the Y and reading while I walk on the treadmill. It is proof that I CAN multi-task. YES! "In the town of Waterby on Fire Island, the rhythms and rituals of summer are sacrosanct: the ceremonial arrivals and departures by ferry; yacht club dinners with terrible food and breathtaking views; the virtual decree against shoes; and the generational parade of sandy, sun-bleached kids, running, swimming, squealing, and coming of age on the beach. Set against this vivid backdrop, The Last Summer (of You and Me) is the enchanting, heartrending story of a beach-community friendship triangle among three young adults for whom summer and this place have meant everything. Sisters Riley and Alice, now in their twenties, have been returning to their parents’ modest beach house every summer for their entire lives. Petite, tenacious Riley is a tomboy and a lifeguard, always ready for a midnight swim, a gale-force sail, or a barefoot sprint down the beach. Beautiful Alice is lithe, gentle, a reader and a thinker, and worshipful of her older sister. And every summer growing up, in the big house that overshadowed their humble one, there was Paul, a friend as important to both girls as the place itself, who has now finally returned to the island after three years away. But his return marks a season of tremendous change, and when a simmering attraction, a serious illness, and a deep secret all collide, the three friends are launched into an unfamiliar adult world, a world from which their summer haven can no longer protect them." 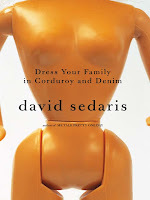 So today I took Dress Your Family In Corduroy and Denim by David Sedaris. So far I'm not too into it. I hope it gets better. Its a memoir about his life. I got it because the reviews say its hilarious. I read it for an hour tonight and I haven't really thought anything was too funny. I'll give it a try though. Who am I kidding, I won't give it a try, I'll read the whole thing, eventually. I can't stand to have a book that I haven't read the entire thing. I did one time, but I had to read the end of it so I knew what happened, it was a terribly boring book, I can't remember even what it was called now, I just know it had a pink cover. So thats all for the latest edition of the Angi Only Book Club. Join me next time.